Nicole, I don't do the whisking, etc., either. I add flour right in with the sausage to brown it before I add the milk at all. I've never had clumps that I can remember... or at least they get confused with the sausage enough that no one notices!One thing I learned this weekend, though; it's not easy making a plate of biscuits and gravy actually look good! Wow it's great to get so much immediate feedback!Kalyn: It can't hurt to eat some every once in a while ;-)Peter: I love 'mopping up' food too!Deborah: I see nothing wrong with eating this for dinner!Curt: I noticed on your biscuits and gravy post that we have similar gravy-making methods. I would love to try it sometime with the smoked sausage...sounds so good!Becky: I'm glad the Q&A helped! I always think it's easier to follow a recipe if you understand why you're asked to do things a certain way. Ruby: Haha...yes, I love it too! I cook/eat a lot of things now that my parents didn't really cook.piealamona: You're welcome! I decided that since I appreciate 'tips and tricks' when I can find them, the least I can do is pass them on to others!Kathleen: Thanks, that's a wonderful compliment! I hope that you'll let me know when try the recipes! Mmmmm, That sure looks grrreat!-Yon, The Wurst Show. Hi everyone, just a quick note! If you look at the gravy recipe again, you will see that I have specified using whole milk. I wasn't specific the first time around, but I always use whole milk in my cream gravy.Katiez: It's funny, considering the name of my blog, that I haven't talked much about salt until now. I think I feel a new blog post brewing ;-)Sandy: I've heard something about adding coffee to gravy (or making coffee from gravy) but have never tasted it. It sounds a little strange but I'm sure it works!Kevin: Bacon grease adds great flavor to everything :-)Yon: Thanks, Yon! Your show looks interesting, I'm going to check it out more later!Alexandra: You're right, the gravy comes together really quick so by the time your oven is preheated and the biscuits are baking, the gravy will be ready!Steve: We'll see. I'm just not a huge fan of fried chicken myself. I tend to like all of the side dishes much better than the chicken itself ;-)Terry B: You're right. While it is definitely possible to over salt a dish (I did it the other day, actually), I think that I could have saved so many 'not-so-great' meals over the years if I would have realized that they just needed a little more salt! I grew up on this stuff. My mom made white gravy and biscuits to go with the sausage and eggs in the morning. Now, if I make it, I do it your way, and make it for supper. Instead of eggs, I make grits and vegetables.Gravy is about the only thing that I add salt to, when I cook. It definitely brings out the flavor. 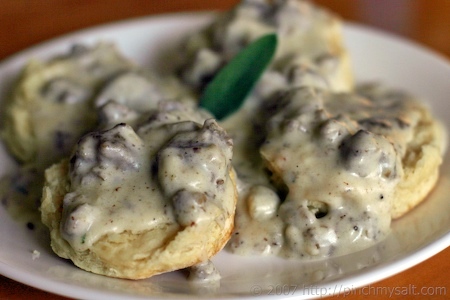 Have always added sage to my biscuits and gravy.. making some right now it's our Sunday morning staple..Years ago I ate some sausage made from pronghorn antelope, and since their diet consists of lots of sage the meat is very sagey.lolI liked it..